Boats, both as beautiful and useful objects, but also for the many meanings they can convey, have always fascinated the artist Jake Lever. 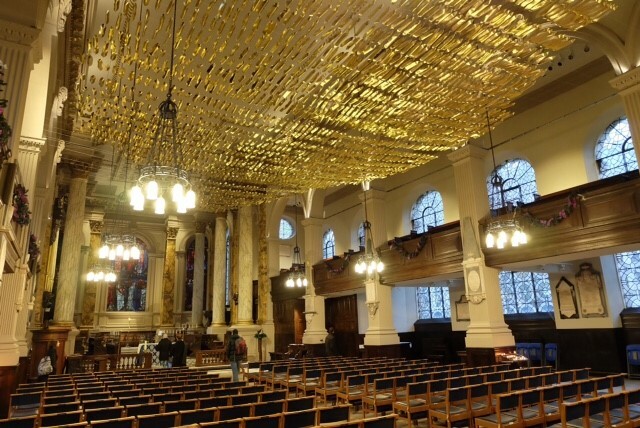 A few years ago as part of a residency at a church in Gloucestershire, he made a five metre-long, gilded boat that hung from the roof beams, almost filling the tiny nave. 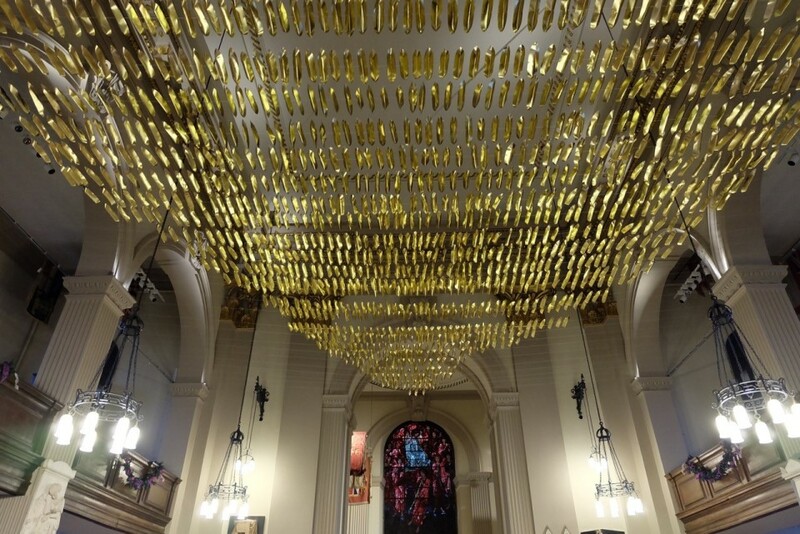 Following on from this, he was commissioned to celebrate the 300th anniversary of Birmingham Cathedral, and took the opportunity to continue his exploration of the image of the boat. He set about working with people across Birmingham and beyond, building the residency into a large-scale community arts project. 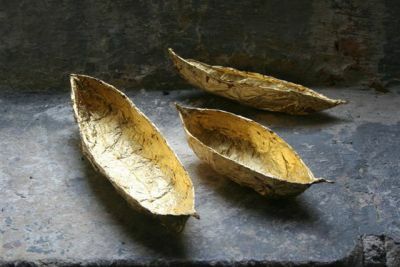 Working with as many people as possible in schools, hospitals, day centres, homes for older people, hospices, churches and at festivals, he encouraged each person to fashion their own boat. Inside, they could write their own thoughts, ideas experiences or prayers. The fact that more and more churches, cathedrals and worshiping communities feel able to host such contributions by contemporary artists is a very hopeful sign. We may, at last, be losing our fear of creativity and openness and be able to allow God’s ‘dynamic process of creation’ to break in and transform our institutions and our lives. Jake Lever: Soul Boats, mixed media on card. Jake Lever (b. 1963) is a British artist who trained at Reading University and at Birmingham City University where he gained his MA in Fine Art. His practice encompasses drawing, painting, printmaking and sculpture, often involving site-specific installations. His work is inspired and informed by a diverse range of sources including Byzantine icons, Chinese landscape painting and Spanish medieval frescoes. He is currently investigating the image of the boat, a powerful visual metaphor for the journey through life. He has exhibited regularly over a period of many years, showing work in public and private galleries and in churches and cathedrals. Jake is also an experienced teacher and gallery educator and has extensive experience of working with children, young people and adults in relation to the visual arts. Jake currently works as a freelance artist, based in Birmingham. He is a Fellow of the Royal Society of Arts and is a Teaching Fellow at the University of Warwick. For more, see http://www.leverarts.com. Meryl Doney is a British freelance fine art curator, specialising in presenting exhibitions in cathedrals, churches, festivals and other challenging spaces. She has curated over 40 exhibitions and performance pieces, including Moon Mirror by Rebecca Horne in St Paul’s Cathedral and Presence: Images of Christ for the Third Millennium, a series of thirteen different exhibitions involving 50 contemporary artists. Between 2006 and 2011 she was Director of Wallspace, a 'spiritual home for visual art' in All-Hallows-on-the-Wall church, in the City of London. In 2015 she was guest curator for CLEY 15, the North Norfolk open-submission exhibition at Cley-next-the-Sea. She serves on the Art Advisory Group for St Paul’s Cathedral, London and is a trustee of the Methodist Collection of Modern Art.